There are many things you can do in this Utility. This will just be a brief overview of what is in it. The right screen is showing the Device Manager, that is what is clicked on when I took this screen shot. Also under System Tools is the Event Viewer, first in the list. You need to be logged in as the Administrator to use some of these items. I do not use for these, they are for Businesses with networks. Right click on a folder for more info. Supports detailed monitoring of the OS resources. I do not use this. Right click on it for detailed info. Determine whether the hardware on your computer is working properly. 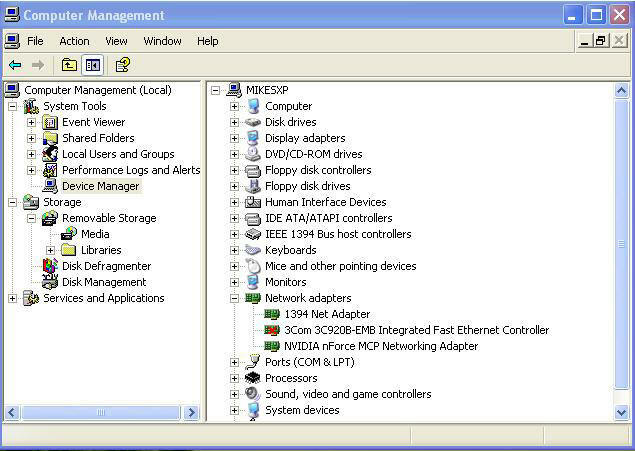 Identify the device drivers that are loaded for each device, and obtain information about each device driver. Change advanced settings and properties for devices. Disable, enable, and uninstall devices. Roll back to the previous version of a driver. Removable Storage makes it easy for you to track your removable storage media and to manage the libraries such as Changers and Jukeboxes, that contain them. Analyzing after large numbers of files are added or deleted. Defrag after installing software or Windows.